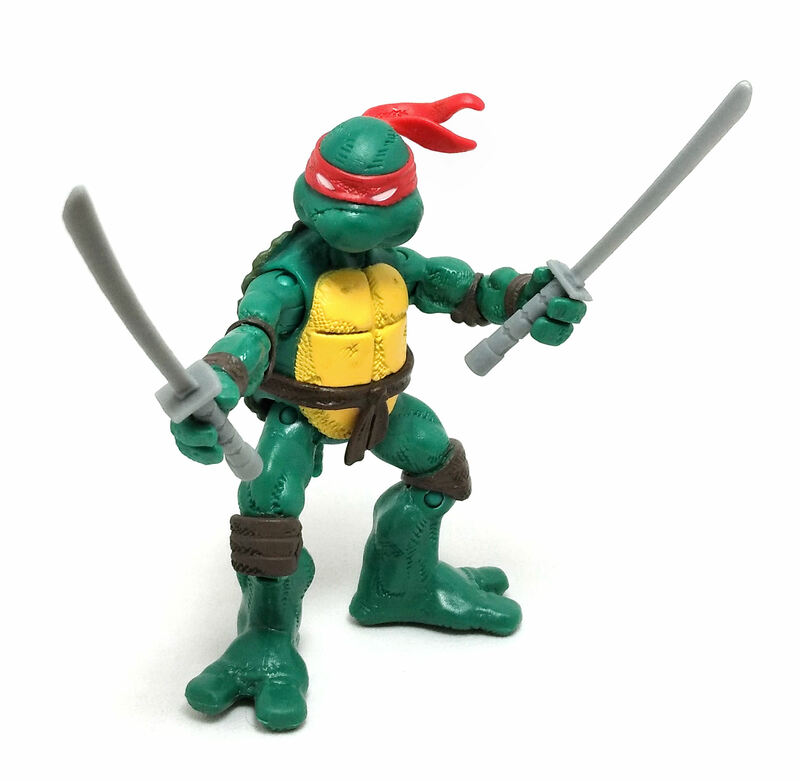 I had not realized for how long has Playmates Toys been producing TMNT figures, but the ones I’ll be reviewing today were released as part of the 11th wave of figures in 2014. 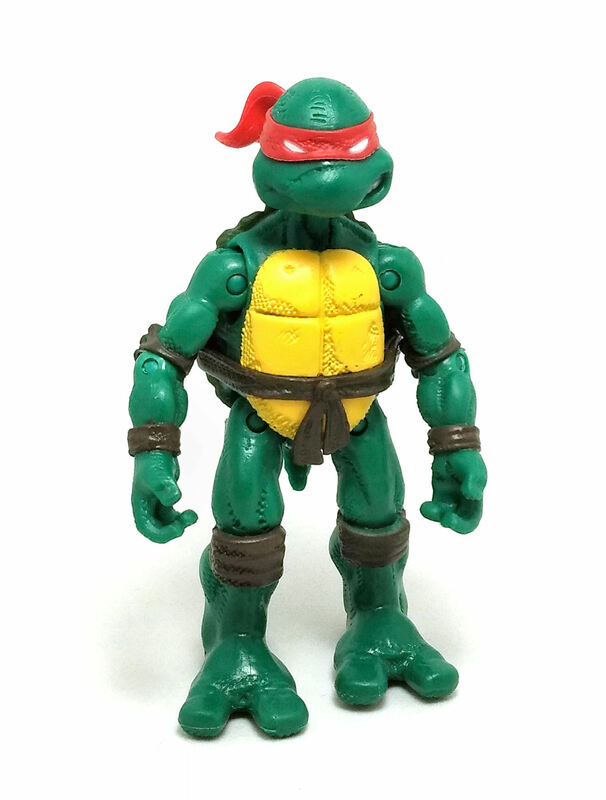 I am talking, of course, about the four Original Comic Book Teenage Mutant Ninja Turtles. Each one of these was sold separately, and the thing that makes them special, in my opinion, is that these are inspired by the art from the Eastman & Laird publications. 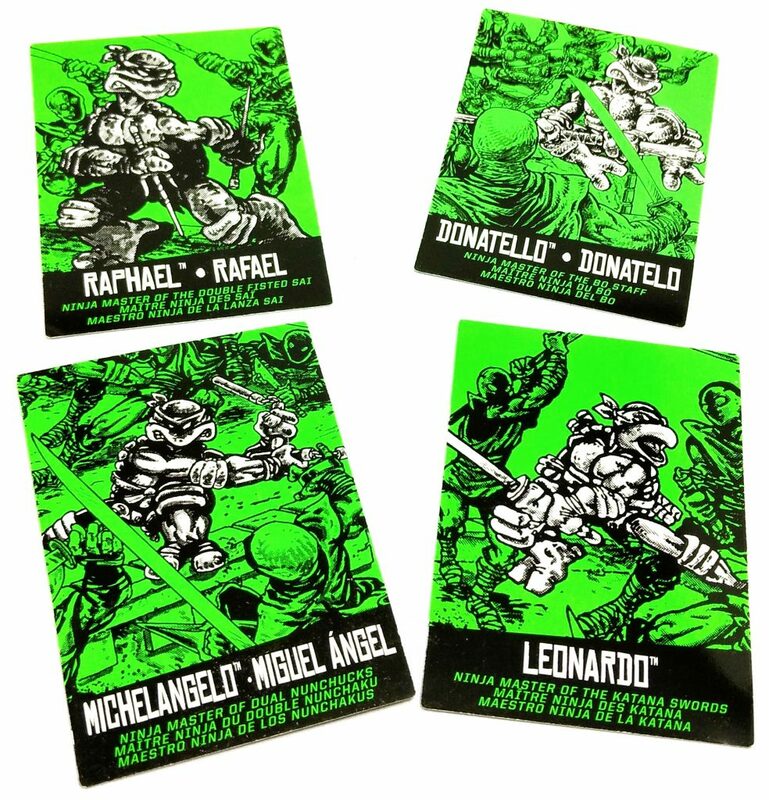 Leonardo, Raphael, Michelangelo and Donatello share the exact same body sculpt, which is befitting to their comic book origins, since they were essentially drawn the same, with only their weapon selection to tell them apart. Later on, when the comic books began to be printed in color, it was not immediately obvious who was who, because originally their masks were all red. To their credit, Playmates wanted to offer some other visual cue to help tell which brother is which, so each has a slightly different head sculpt, the main difference being which side of the mouth is showing teeth and also, the ribbons on their masks all flow in different directions. 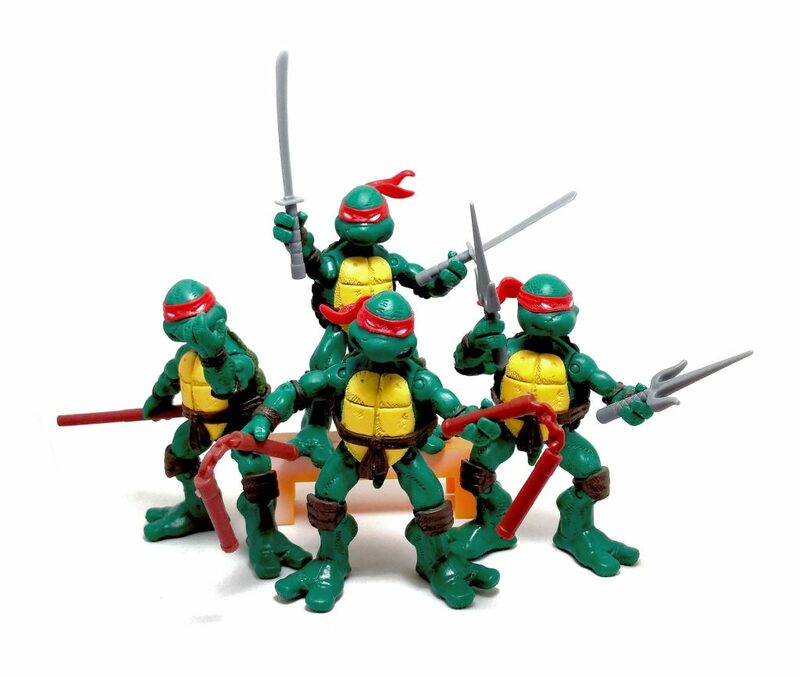 Therefore, Leo can be identified by the closed-mouth, dour expression, Mikey has teeth clenched on both sides of the mouth, while Donnie bares his right side chompers while Raph does the same on his left side. The sculpting style is quite interesting, in my opinion. It captures nicely the look and proportions from the comics down to the inclusion of tails for each character, a trait dropped later on for the cartoon based figures. One interesting aspect of this sculpture is that in an effort to drive the whole comic book style home, each turtle displays “shadows” sculpted in the form of a rather granular texture on very specific, recessed areas on the figures. These textured areas are meant to mimic the appearance of the printing process on old four-color presses, and to be honest, I wasn’t too taken with this decision, but I have grown used to it over time. Overall, these joints provide a decent amount of posing options, although they really need wrist joints to offer a lot more posing options with their weapons. 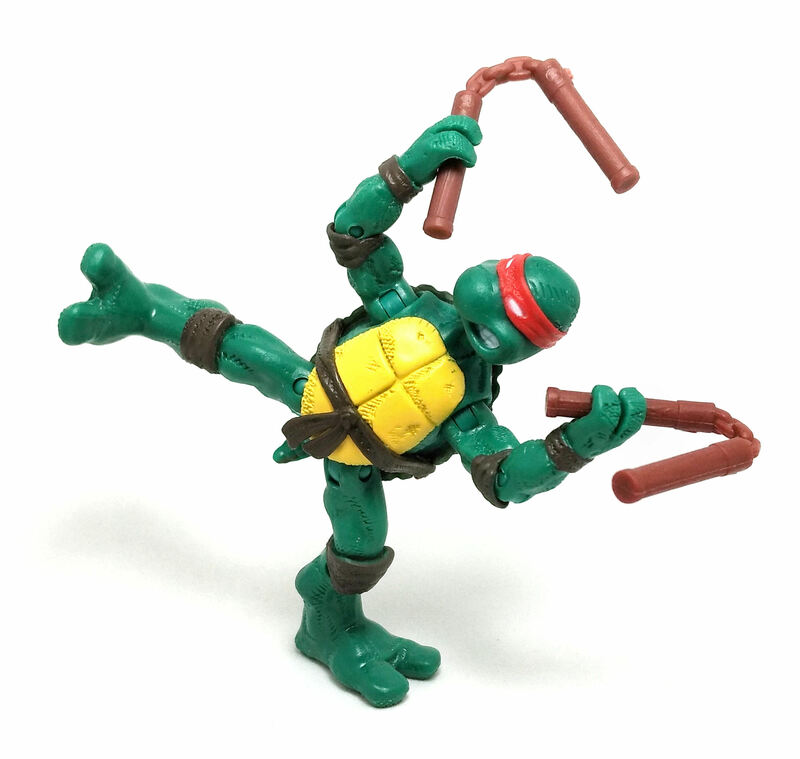 On the bright side, these turtles have mad stability even on one-foot stances. 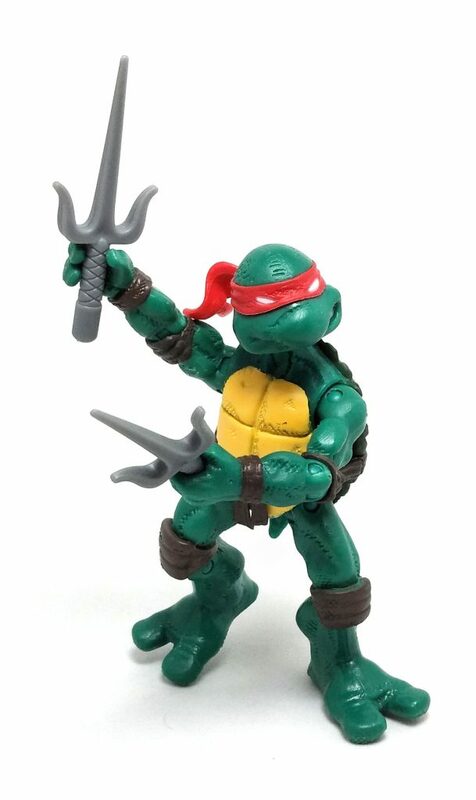 Speaking of which, the Turtles come each with just their respective, trademark weapons. 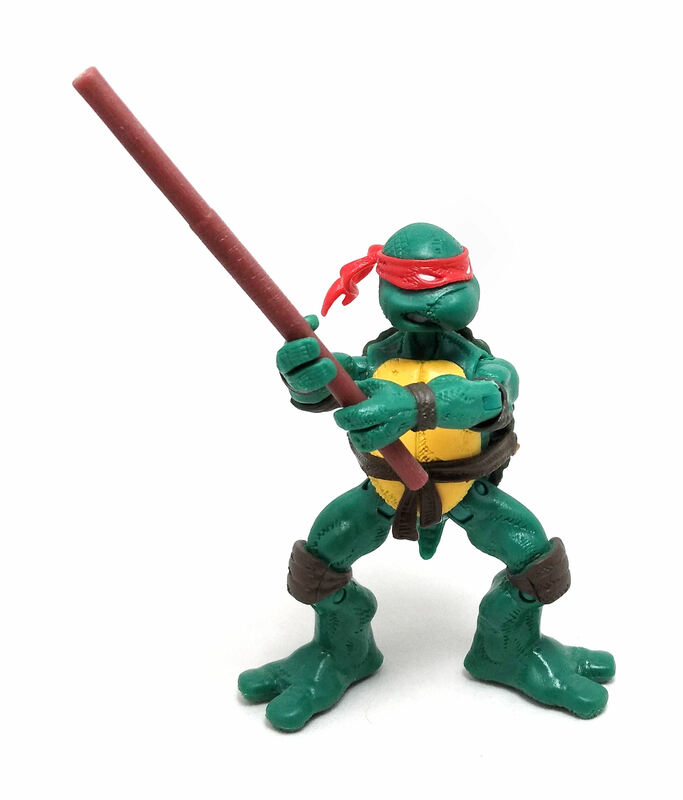 So, Leo has his trusty swords, Raph a pair of sai, Donnie a bo staff and Mikey a couple of nunchuks. All of the weapons are cast in either gray or brown plastic, without any form of decoration. 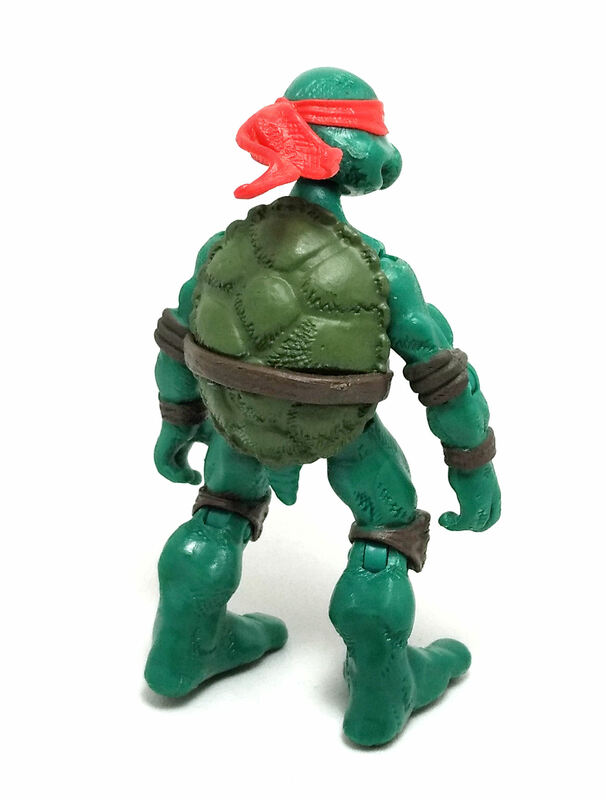 The paint applications on the Turtles themselves are the bare minimum. Their torsos are painted light yellow and the shells on their back are dark green. The limbs, their belts and the masks are all cast in their respective colors, but the kneepads and the elbow pads are painted to match the look of the belt pieces. The only painted bits on their faces are the solid white eyes and their teeth, if visible. One nice pack in with these figures is a collectible card. These cards are quite striking, boldly printed in black, white and green, showing the corresponding character in an action sequence presumably taken from the original comic books. Overall, I am quite satisfied with these Original Comic Book Turtles, giving each of them the exact same score, as I cannot think of a significant difference among them.